Starting a campfire is easy. A few simple steps and you'll be relaxing around a cozy campfire. Before starting any campfire, check to be sure that campfires are permitted at your campsite. Where it's permitted, gather wood for your campfire. You want to collect everything from dry leaves and twigs, to small sticks and branches up to 2-4 inches in diameter. If a fire ring is not already available, clear an area that's away from any trees or brush. A circle of rocks will help contain the campfire's ashes. 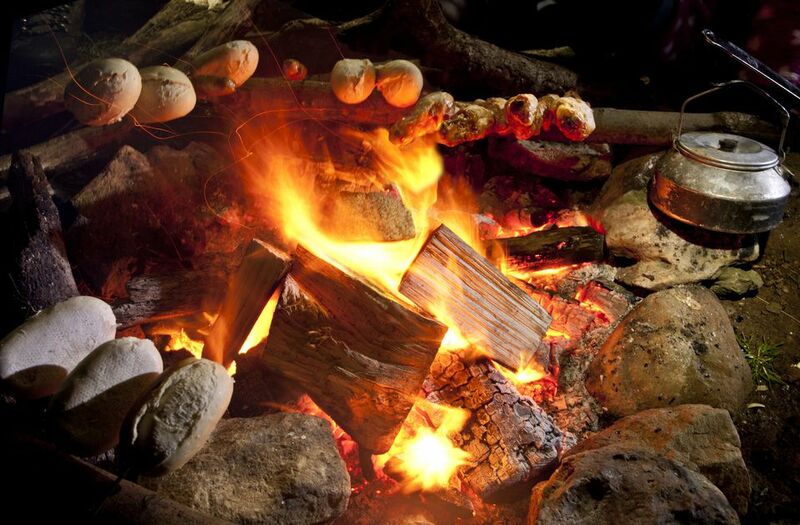 Place a small pile of dry leaves and twigs in the center of the fire ring. Build a tepee of small sticks around these dry leaves and twigs. Next, build a square wall of larger sticks around and up to the height of the tepee. Place more sticks across the walls so as to cover the tepee. Add another wall of larger branches, but do not cover the top. Drop a match or two into the dry leaves and twigs until they catch fire. As the fire begins to grow, add some larger branches across the top, being careful not to collapse the existing walls of the fire. Continue to add larger branches and pieces of wood to keep the campfire going. Don't start a bonfire; campfires do not have to be large to be enjoyable. Do not use flammables such as charcoal lighter, gas or kerosene to start a fire. Do not burn "green" wood, it has too much sap, which will cause it to burn slowly and pop. Also, do not cut any wood from standing trees. What Are the Packing Essentials for Backcountry Camping?